We’ve been doing quite a bit of remodeling in our house with laying carpet and tile. After coming home from work and then spending time on the house we really don’t want anything to heavy for dinner. So this dish is just perfect, and really easy to make. In my pantry I always have two types of tuna. The first one is only for really special occasions, and that’s my Italian tuna that’s packed in olive oil. I use this one for my tuna tapenade for entertaining. The second one is,well you know the kind that’s available in every store and packed in spring water. I start out with a large bowl and throw in 2 large packs of the tuna. Then I add 1 small package of thawed frozen peas, that still have a little bit of their chill left on them. 3 stalks of celery chopped in 1/4 inch dice. I tablespoon of Kosher salt, 1 teaspoon of black pepper, (this is totally optional, it’s because they were staring me in the face, I threw in 2 tablespoons of golden raisins), and finally 3/4 cup of good mayonnaise. Stir it all together gently so not to break up the tuna too small but well enough that everything is totally coated with the mayo. Last but not least the pasta. It’s important to me with this recipe that I use only the little short tube shape pasta, it’s the same one that I use in my Italian wedding soup. I think it’s called Dittalini. I just garnish with a little fresh basil and that’s it. 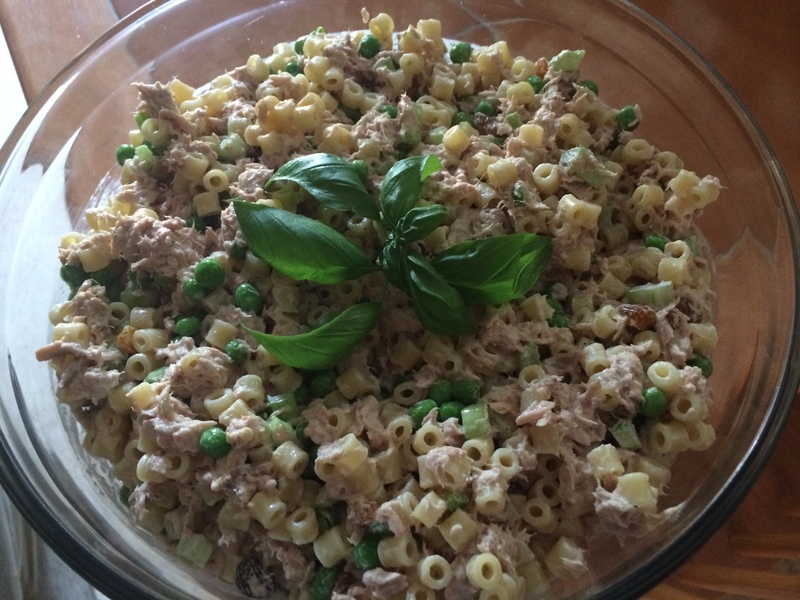 Try this recipe if you love tuna pasta salad. You won’t be disappointed, I promise. Oh I have to say, the golden raisins added a touch of sweetness to this dish.